When a tenor horn was stolen from the car of a Salvation Army member on Remembrance Sunday, the group did not expect to see it again. So it was a surprise when the Cradley Heath branch received a call from an antiques dealer believing he had been sold the missing instrument. The horn, which was due to be played at a Remembrance Service in Cradley Heath on the day it was stolen, turned up at a second-hand shop in Blackheath just a few days later. Salvation Army members had been trawling shops in the area on the off-chance it may have been offered for sale - and luckily they managed to find the right one. 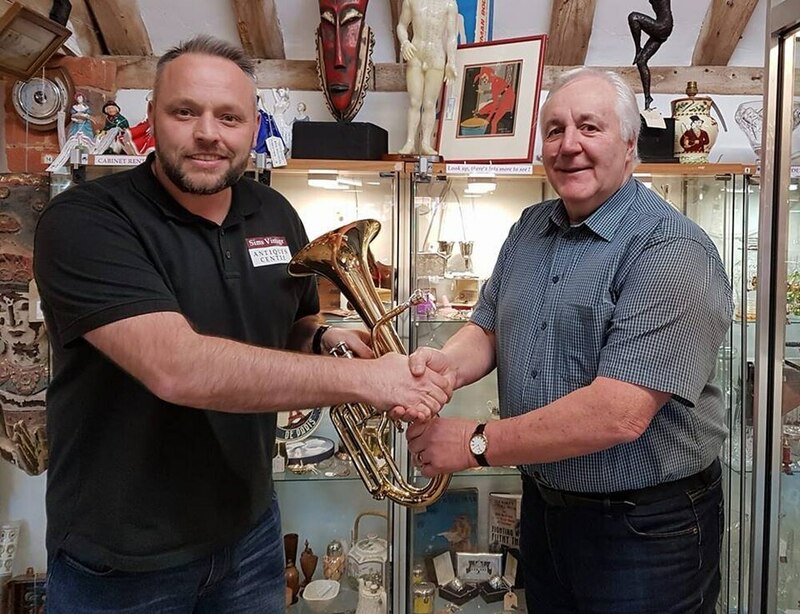 The horn, estimated to be worth around £1,500, has now been returned to group after they were contacted by antiques dealer Phil Sims. Mr Sims, who lives in Clent, near Stourbridge, runs Sims Vintage Antiques Centre in Warwickshire but was running his nephew's shop on the day the instrument was brought in. He explained: "My nephew called asking what instrument I had bought as somebody had been in to ask whether anybody had been offered a brass instrument. "Straight away I got in touch with the Cradley Heath branch of the Salvation Army. They came over and matched the serial number to confirm it was their instrument. "They didn't expect to have it back." The instrument was stolen from a car at the home of a Salvation Army member in Cradley Heath. Father-of-two Mr Sims, aged 44, added: "I have got integrity and am honest enough not to be associated with stolen goods and get it back to its rightful owner. They said most people would have just sold it." The Salvation Army played on despite the loss of the horn on Remembrance Sunday at a cenotaph near the former St Luke's Church. Band leader John Shepherd, 69, who has been associated with the Salvation Army most of his life, admitted he was taken aback when he head the horn had been found. He said: "You don't normally get any trace of them. We were pleased when we heard he had got it. "Phil was very nice about it. He must have lost a lot of money." The police have now been contacted regarding the theft of the horn. Mr Sims said he was sold the instrument by a man thought to be in his 20s, with a slim build and short dark hair. "He said he had inherited it from his grandfather and he wanted to sell it on. It was as simple as that," Mr Sims said.